It’s essential, too, that you make the most out of your exams. We’ve included a range of questions for you to ask during your next eye exam, or if necessary, before your exam to avoid any miscommunication. We hope you find these helpful and that the information contained in our EyeGlass Guide 2.0 will help to facilitate a comprehensive and informed dialogue between you and your eye care professional. Do you accept my insurance plan’s vision coverage? Is payment required at the time of service? What will my eye exam entail? How long should I expect to be there? Will my pupils be dilated? 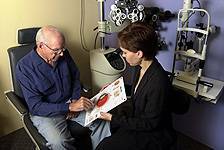 Given my age, eye condition and other risk factors, how often should I have my eyes examined? At what age should I start to schedule my children for regular eye exams? What lens designs and options are a good fit for me? Can my glasses block UV rays? Do all sunglasses protect my eyes from UV rays? What are photochromic lenses and are they a good option for me? Don’t forget, if participating in a flexible spending account program, you may be able to use the account to pay for portions of your eye care not covered directly by your insurance plan. To create a printable personal eyeglass suggestion based on your own preferences and lifestyle, use our interactive tool.